A website may have to encounter several hurdles in its way of progress if not monitored on a consistent basis. Even though, issues about server and network are pretty common for every website, a powerful server monitoring tool can decrease these issues to a large extent. In fact, there are several free monitoring tools that one may use to avoid server crash and various other issues caused due to overload. In this post, we will share the Top 8 Free Server Monitoring Tools that you may use in measuring various aspects of server health including the response time, CPU usage, memory usage, disk space and hence, maintain a stable website health. Nagios Core is a Linux-based server monitoring tool and happens to be one of the most widely used server monitoring tools for the past many years. It helps the users detect the different bugs and resolve them before any damage is done by them to any of the important processes. Apart from this, users can configure this tool to monitor the system metrics, network protocols, applications, servers and more. Most importantly, users can keep themselves aware of every system failure and that too in real time through text message or email using this Nagios. Icinga 2 is an extremely powerful open source Free server monitoring tool with an excellent user interface. The tool helps the users monitor the performance of their server, network, and applications, receive alerts, use plugins for extended functionalities and more. Icinga 2 helps the users handle the network related issues in no time. Also, Icinga 2 has a dedicated team to help you with every single technical difficulty that you may face with this software. It is certainly its powerful features and dedicated support that makes it hugely popular among its users from all over the world. Zabbix is a brilliant open source enterprise-class network monitoring software that can monitor multiple servers, virtual machines, databases and network hardware simultaneously. Interestingly, Zabbix offers great scalability and also, it can process over 3,000,000 checks on a daily basis. Most importantly, with Zabbix, users don’t really have any limitations as vendor lock-in or limitations on the number of devices in use with the software. Also, it offers support for both IPV4 and IPV6, support encryption and secure SSL connection. A lot of users have been greatly benefitted from the use of Zabbix over the years and the tool continues to find its way increasing towards increasing popularity.because of its powerful features. OpenNMS is a dedicated server monitoring software and is available as both free and paid versions. The tool is great for both startups and big businesses. The OpenNMS version, Horizon can be used for free to monitor your server performance. However, the version Meridian is a paid version and users need to buy a license to use it. Meridian is especially suitable for those users who are looking for a consistent long-term monitoring solution. What’s most advantageous about OpenNMS is its dedicated and passionate community actively engaged in answering to each other’s queries. 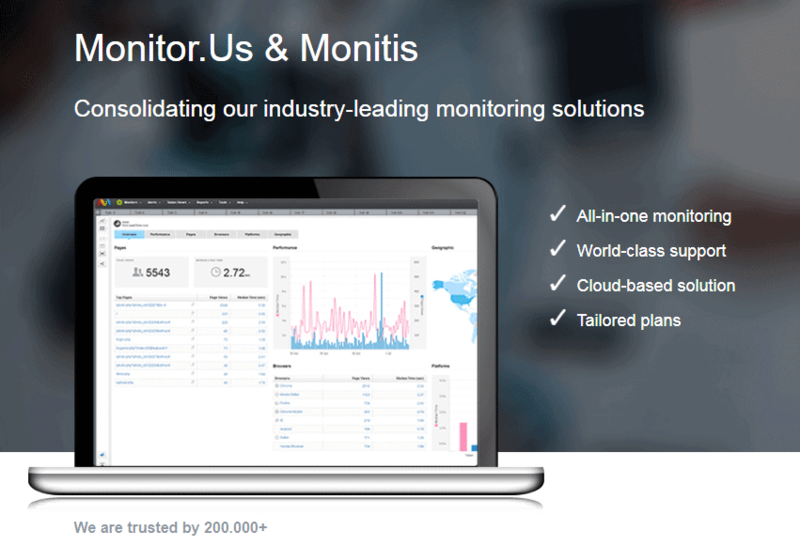 Monitor.Us is a free cloud-based Free server monitoring tool powered by TeamViewer. The tool helps users monitor Windows and Linux servers' services and performance in terms of availability of workstations, CPU, memory, disk, and bandwidth. The greatest advantage the users have with Monitor.Us is the fact that it is cloud based which means one doesn't really have to install, configure or update it. That saves a lot of time, right? On top of that, users can monitor their networks and databases using custom dashboards. The tool has proved to highly effective for many users from all over the globe in ensuring a proper server health by helping the users identify and resolve the server related issues in no time. Server Health Monitor is a free yet advanced server monitoring tool. The tool offers you a very clear picture of every aspect of Server Health. It helps you monitor the performance of several server hardware components such as fan speed, power supply, CPU, battery, temperature and more. Also, it helps you identify issues in time by sending you real-time alerts and resolve them really fast. Most importantly, it can monitor the status and performance of hardware components of up to 5 servers. Over the years, a lot of users found it to be pretty effective in dealing with various server issues. The BSD licensed open-source monitoring tool, Ganglia is especially suitable for high clusters and grids based computing systems. It offers brilliant advanced technologies such as XML for data representation, XDR for compact, portable data transport, and RRDtool for data storage and visualization. Most importantly, it supports different operating systems and processors. Also, it compares the various hosts to check if any host behaves differently from the others. This tool certainly has some of the most powerful features to help you maintain a consistently stable server health. CollectD is an excellent open source daemon which analyzes and stores data related to the basic system performance such as CPU utilization in multiple formats over the time. Then, it represents the data in the form of a graph. Also, it supports multiple OS. Users can use this tool to monitor the performance, system load over time and set important alerts. Most importantly, the tool comes with over 100 plugins to offers users with an absolutely advanced experience. On top of that, it offers extremely powerful networking features. If you haven't started on server monitoring yet, trying this tool is certainly not a bad idea, to begin with. No matter you are a technical genius or not, server and network monitoring is something which should never be overlooked else things may get pretty devastating for your website all of a sudden. In this post, we have discussed the Top 8 Free Server Monitoring Tools that you can give a try. We suggest that you try all the eight free server monitoring tools and then, decide as to which tool is the most suitable for you in terms of convenience and of course, features. Most importantly, it can help you save some money as you learn to manage the IT aspect of your website on your own.